Grab your friends, grab some beers, and put away the fine china. Million Dollar Fix are here, and they are on a stomping, pounding, partying rampage. This Canadian four-piece is a rock’n’roll force of nature, whose winds will surely be blowing back hair and lifting skirts all across the land. 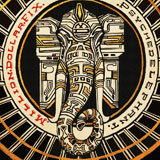 Their 2012 full-length, ‘Billygoat,’ was a loud, raucous, good-times opus, but the newly released EP, ‘Psychedelephant’, has ramped everything up to eleven. What the EP lacks in length, it more than makes up for in quality. The band kicks things off in high gear with opener ‘Never Fight Her Flow,’ letting you know just what’s about to go down here: some raging righteousness. Jeff Shibby Smith’s drums thunder through the speakers, and Keegan Costella’s roaring bass provides tremendous weight to the low end. The dynamic rhythmic duo are quickly followed by the double barrel six string attack of Logan Derby and newcomer Brad Weidlich, laying down a groove-heavy riff that is infectious in its catchiness. Things get a little fuzzier on ‘The Crow,’ and that’s a good thing. Million Dollar Fix’s classic rock leanings shine through here, with a truly 70’s hard-rock feel, crackling snare hits and wildly powerful lead guitar licks, before it all gives way to a triumphant chorus and a simultaneous dual guitar run that is almost reminiscent of Thin Lizzy. ‘Hoptical Illusions,’ my favorite track on the EP, is led in with a steady gallop by Costella, who is joined by his band-mates one by one, the whole ensemble quickly swelling into the most rowdy and headbang inducing anthem yet. Weidlich soars on this track, with a blinding, fiery solo that will have you playing air-guitar along with him. ‘Kill The Banker’ opens with a slow moving psychedelic lead, and much like the EP’s name suggests, transforms into a massive, loud and hard stomping elephant. The vocal work is consistently great, capturing an old school sound that many vocalists these days have unfortunately abandoned. It’s clear, commanding, and all at once rousing and lighthearted. If this EP was the sound of a party, the events unfolding at the scene would surely be endlessly wild and debauched. This party is massive, it is deafening, and above all else, it is loads of fun. As a whole this release is steadily high caliber, diverse, and entertaining. One wonders where Million Dollar Fix could go from here, but they show great promise and skill. If ‘Psychedelephant’ is any indication, this is a band that will continue aiming for and reaching new heights in the future.